I chuckled when I saw “flock-sourcing” listed as one of the “Jargon Watch” terms in David Schwen’s recent column in Wired (Feb. 2016). outsourcing medical diagnosis to pigeons. If trained to interpret microscope images or mammograms, groups of pigeons can spot signs of breast cancer as accurately as pathologists. Flocks would initially be enlisted to test new medical imaging software. This had to be satire. Schwen was obviously taking a jab at crowdsourcing by introducing a herd-mentality angle or something like that. I wasn’t quite sure—a lot of this kind of clever high-tech geek humor goes right over my head. Not because I don’t have the capacity to understand it, but because apathy usually urges me to move on to what’s next after a few seconds. But this was a serious column, and couldn’t be satire—all the other jargon terms in the article made sense and seemed legit. There’s really not that much variety when you Google “flocksourcing.” Pigeons were only mentioned once toward the bottom of the results page, but I didn’t even get that far initially. I was drawn in by a different use of the term that dominated the top search results: a “guided crowdsourcing” campaign dealing with bus routes in Dhaka, Bangladesh. The campaign began in 2012 and a Kickstarter was successfully funded shortly thereafter. I didn’t even know which country Dhaka was in, let alone that it’s a capital city. 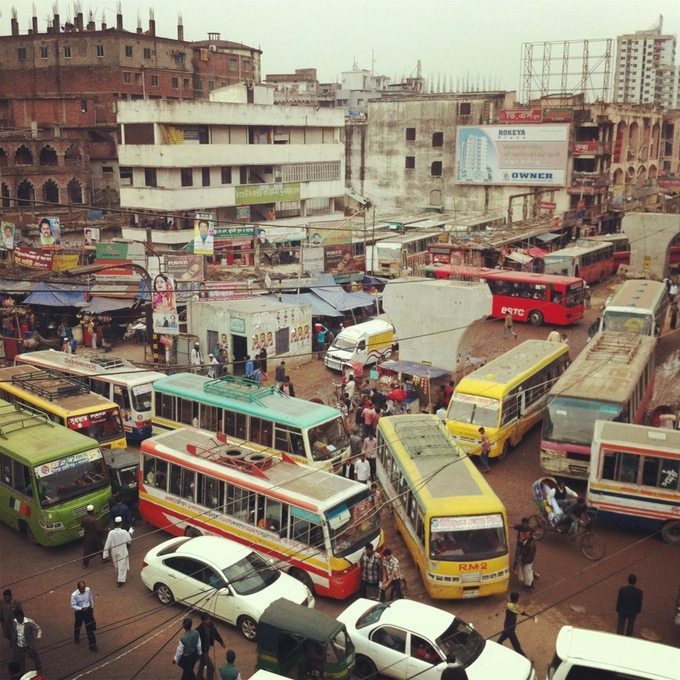 Looking at the pictures of Dhaka gridlock only found in nightmares, along with the background information on the Kickstarter page, it’s no wonder that something innovative needed to be done to bring some kind of sense to the mess that’s called bus transportation. Wikipedia told me that Bangladesh is one of the world’s most densely-populated countries, and Dkaha alone is home to 18 million. With car ownership at 1%, publicly- and privately-owned busses are in high demand, and the system is perplexing at best. I won’t try to rehash the details outlined on their Kickstarter page—I strongly recommend you read it. The project defines and pioneers flocksourcing in this regard: “Flocks + Mobiles = Flocksourcing, a new technique for rapid generation of urban data.” A “flock” of volunteers with mobile phones are braving the Dhaka bus system to collect data about the routes and times and whatnot, and talk with the patrons. The information is then analyzed and used to (hopefully) improve the bus experience. I’m fascinated by this, and learned a lot not only about the mysterious “flocksourcing” term, but also about Dhaka and its societal and cultural issues. It means that they gathered information from an actual flock of birds. They trained four pigeons to look at x-rays and peck at colors, and the results were collected and carefully scrutinized. They’re smart little birds, so I’m told. Not quite smart enough to diagnose cancer at this point. But smart enough to help researchers develop and improve medical imaging technology, which is good enough for me. Both versions of “flocksourcing” taught me a lot, but I’m much more interested in what’s happening to bring order to a seemingly hopeless mess in Dhaka. It’s an ongoing project, now in its fourth or fifth year. It’s understandable, given the maddening complexity of the bus situation they’re tackling. Of course they’re both playing off the current crowdsourcing craze. Thanks to Wired for this small tidbit that made me that much more aware.